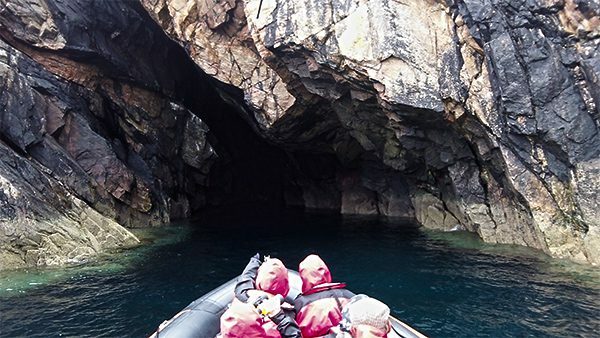 Enjoy a scenic 2 hour RIB trip to Gallan Head taking in the stunning views of Reef Beach, Pabbay, and Cliff bay, sailing past the archway to see the Kittiwakes which nest precariously close to the edge of the cliffs. Gallan Head is the most north westerly point of the UK and has some of the most spectacular sea caves on the west coast. The headland and nearby reef provide some of the best feeding areas for basking sharks and whales, which are regularly seen on this trip. Humpback whales have been seen breeching in this area. We wil also look out for fulmars, shags, razor bills and the occasional puffin. Depending on the weather, we may then go round the Gallan or turn towards the small island of Harsgeir, home to many nesting birds, including eider duck, black back gulls and cormorants as well as grey and common seals. On our return journey to Miavaig we may stop off at the island of Vacasay to check our lobster pots. This trip is suitable for all the family and runs twice weekly – please check our timetable for sailings or ask for details when booking.